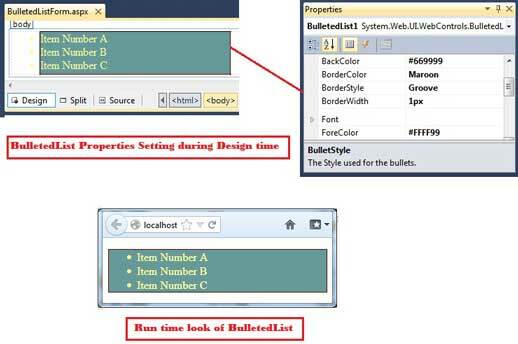 In ASP.Net whenever you start design a WebForm, you may use a bullet List where your desire content will present, you can use this BulletedList as Text, Hyperlink or LinkButton mode. You can adjust List with numbers order or bullet order. (1) How To add BulletedList with Items? (2) How To Change Style of BulletedList? For Adding this control, go to ToolBox and Find “BulletedList” control and select it. Then Drag it to your WebForm. After that click on “BulletedList Tasks” button. This process will present a List with containing “Choose Data Source…” and “Edit Items…”. Click on “Edit Items…” option. This will present “ListItem Collection Editor” screen. In this Screen. You can add items whatever you want. For add items, just click on “Add” button from “ListItem Collection Editor” screen. Then select one by one item for change Text name. When you select Item, it will show you Properties in right side pane. Go to “Text” property and change or input text name whatever you want as we mention as “Item Number A”. Like this you can add Items and change item name with following above given image steps. When you complete this process, the source code of this control will looks like bellow. If you want to change style of this control, you have to go to “Properties” window after selecting this control. When you change this settings, it will change this controls looks different as shown bellow image. After complete this process. Lets start next process. In Next process, we will change the Bullet Style and Display Mode. When you go to Properties screen, You can choose “Display Mode” in which you can select following mode. In ASP, there is some bullet style you can use according to your need. 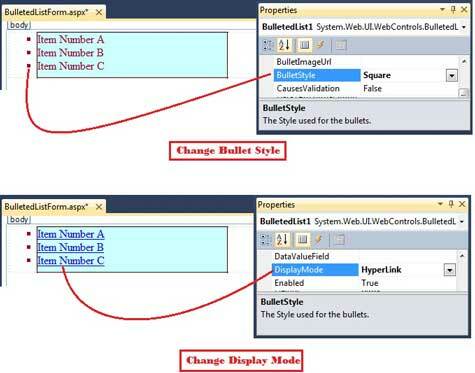 There is following BulletStyle in ASP.Net. Now after apply these settings you can change the mode and style of this control. Suppose, you want to change DisplayMode with HyperLink and want to add some Link inside every items. Then go to Source window and apply following link add process. Link Add Process on this control's Item. 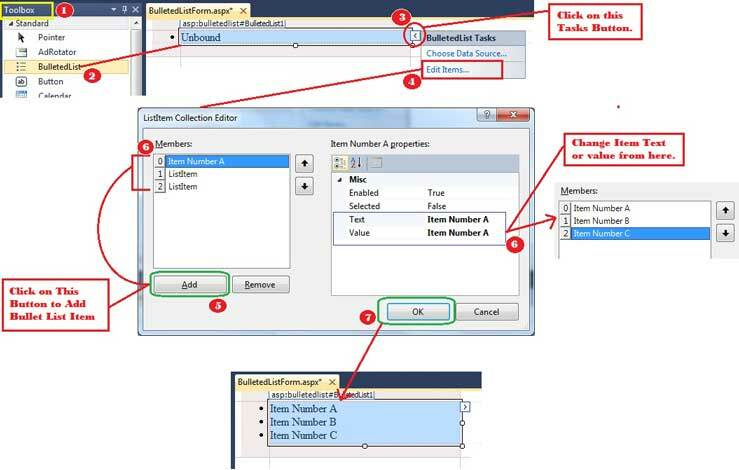 For add link, you have to pass Value inside “asp:ListItem” as shown above given instruction. When you run application and click on particular item one by one, it will redirect you to given link. You can also link to you WebForm. 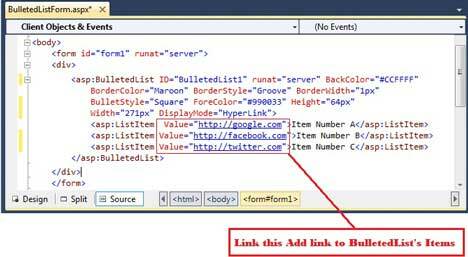 So, this is the way to use BulletedList in ASP.Net with easy step by step process. You can apply this process and change BulletedList with different style and features in ASP.Net with SKOTechLearn.